31+ Days of Horror. 33 Horror Movies. 33 Reviews. Hooptober Challenges and Bonus Tasks. 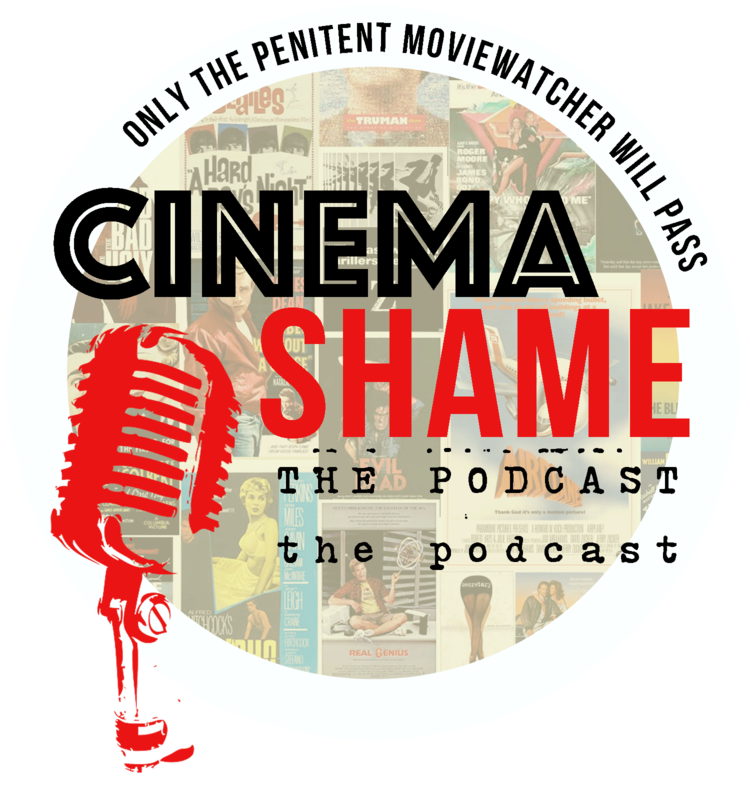 View my 2017 Cinema Shame/Hoop-Tober Watch Pile Shame-a-thon Statement here. 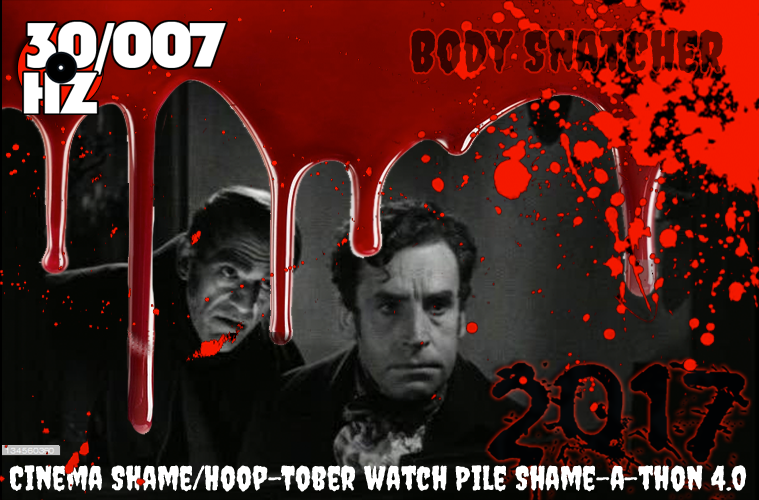 I crashed #TCMParty last week because I knew The Body Snatcher was a Lewton-produced, Karloff-starrer I hadn’t seen. When showtime arrived, I tried to change the channel, but what ho! I was recording Brooklyn Nine Nine and This is Us. A show I wouldn’t miss and one show I’d be dead if I deleted. As it turned out I owned The Body Snatcher in the Lewton DVD set, so I bustled over to my box-set bin and unearthed the beauty just in time to tune in with the TCM broadcast. Some years ago, I immersed myself in the literature and film of “body snatching” and the culture of 19th century grave diggers in order to write a short for my MFA thesis. Among many others, I read the Robert Louis Stephenson story that supplied the story of The Body Snatcher. 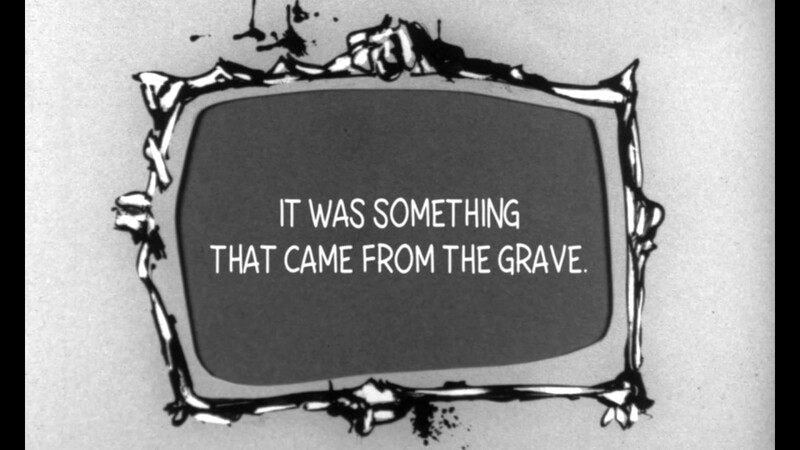 I read up on Burke and Hare and all sorts of other true tales of grave robbing and the like. It’s a wonder anyone survived this period in medical history. This kind of thing happened all the time. The Body Snatcher rang true with many real life accounts. Medical schools lacked cadavers, and certain nefarious types know how to get cadavers. Though I came away schooled in the profession, my short story never really came together, and it ultimately hit the cutting room floor after a few fruitless revisions. If I dig I might unearth a copy, but something tells me that it’s not worth the effort. It might be better off buried. It concerned the story of a grave digger who dug his own grave, but couldn’t bring himself to lie in it. A nice pick-me-up, you know? Death arrived Tuesday around noon. He started to introduce himself to Broxton, but the gravedigger hushed him. “I know who you are,” he said. “In my profession, you better know Death when you see him. But I would really rather call you Phil than by your proper name.” Death agreed to being called “Phil” and sat down beneath a nearby poplar and watched Broxton dig. Broxton dug for a long while. Death grew bored and passed the time by talking about the recent heatwave and how it had kept him busy much of last week with farm animals and the elderly and how the whole thing had really left him little time for recreation. When Broxton finally spoke, he asked Phil why, exactly, he’d chosen to sit under this tree, in this particular cemetery, if it was indeed recreation he sought. If anyone’s interested in reading a story that goes absolutely nowhere, I can pass around copies. My adviser had some choice words about this piece of literature that would be enough to sway anyone from ever attending a creative writing program. But back to Robert Wise’s The Body Snatcher. Dr. Toddy McFarlane needs cadavers to practice newfangled surgeries. A student named Donald encourages Dr. Toddy to perform a miraculous procedure on a young girl (Tiny Tim in everything but name). Toddy promotes Donald to be his assistant and soon Donald starts to question where Toddy’s getting his parade of corpses. Toddy has, of course, been obtaining bodies from the local cabbie — because where else would you get dead people? Donald starts to ask questions about the legitimacy of this enterprise. I enjoyed the tone and pacing. Boris Karloff’s brilliant turn as the unscrupulous “snatcher” keeps the entire enterprise afloat, but like most of these Dickensian-era grave-robber tales, I find them too mired in the period to be effective as moody shockers. The Burke and Hare story has become so well-trodden as cinematic fodder that it’s almost meta to reference the Burke and Hare murders in a story inspired by Burke and Hare. As a result, I’m convinced there’s a more interesting story to tell here. Wise plays it entirely straight, and without any likable characters I found myself lacking anyone to care about in this tale. The righteous characters are willfully ignorant or insufferable and the evildoers are buffoons. We’re left with Karloff’s grave cabbie-turned-robber-turned-murderer as the heart of the production. As he’s merely the villain-in-name, Wise’s production under-serves this character in favor of the surgeons, aka the villains-in-subtext. When you’re cheering on the offing of annoying minor characters (the blind street singer/Little Match Girl, for example), something’s gone slightly amiss in the execution. As the final cinematic pairing of Karloff and Lugosi (the latter’s role is minimal), The Body Snatchers has a built-in curiosity factor. The sight of either of these two actors on-screen elevates the film, but Wise naturally focuses on Daniell’s Doc and Wade’s assistant. 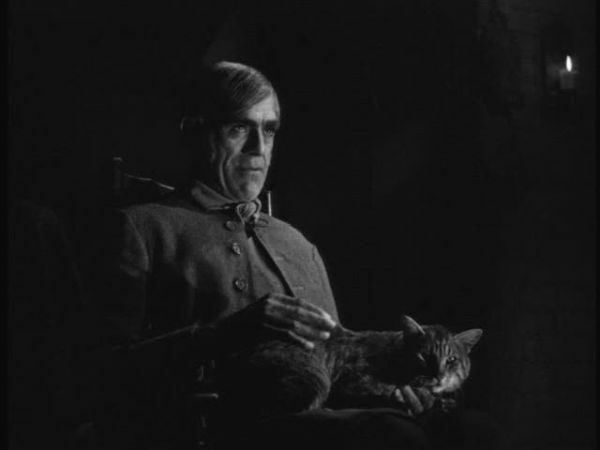 There’s enough of Karloff’s brilliance to recommend a viewing, but I would expect viewers to be merely whelmed overall. I wanted something greater from a Lewton-Wise-Karloff-Lugosi production so perhaps expectations damned my enjoyment. So forget everything I just said and go in cold. Okay? I know The Body Snatcher has it’s boosters, but it’s pretty far down on my Lewton list of favorites. 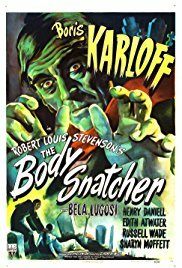 I watched The Body Snatcher from the Val Lewton Horror Collection. 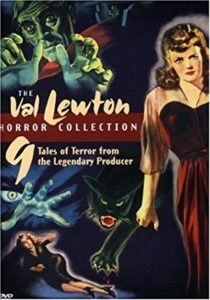 While the price of that little 9-film box set has soared to upwards of $100, you can still rent or purchase the individual Lewton films from Amazon for $3/$10. Of course if you want all 9 films it makes sense to just splurge for the OOP set because at least you’ll get physical copies of all the films rather than those digital thingamajobbers.